AMPTRON® Lithium Iron Phosphate (LiFePO4) battery chargers are state-of-the-art battery chargers with a charging profile specifically designed to charge and maintain Lithium Iron Phosphate (LiFePO4) batteries, and can safely achieve a 100% State of Charge. The 30A 12V model charger operates from mains AC 200-264V as input, supplying up to a large 30A charging output suitable for nominal 12V LiFePO4 battery banks. The charger's built-in protection technology provides protection against Over Voltage and Over Current output, Short Circuit and Reverse Polarity making it very safe to use. AMPTRON® Lithium Iron Phosphate (LiFePO4) battery chargers have a built-in Protection System to prevent damage to the charger from almost any external accidental occurrence that would normally cause damage. The internal Protecion System will automatically disconnect to prevent damage to the charger, and will automatically reconnect when the error condition has been resolved. 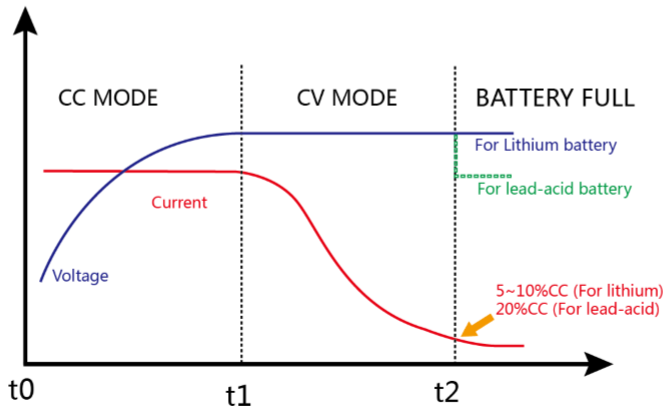 Over Voltage Protection - When the charger output voltage exceeds the maximum charging voltage, the charger enters a standby state. It will restore to normal working conditions automatically after troubleshooting. Over Current Protection - When the charger output current exceeds the maximum charging current, the charger enters a standby state. It will restore to normal working conditions automatically after troubleshooting. Short Circuit Protection - When the charger detects a short circuit at output terminals, the charger enters a short-circuit protection state. It will restore to normal working conditions automatically after troubleshooting. Reverse Polarity Protection - When the charger detects that the polarity at the output terminals are reversed, the charger enters a reverse polarity protection state. It will restore to normal working conditions automatically after troubleshooting. This Protection System is designed to last throughout the life of the charger and provide reliable charging for thousands of cycles. AMPTRON® warrants each AMPTRON® branded battery charger sold by AMPTRON® or any of its authorized dealers or distributors worldwide, to be free of defects from the date of sale for 12 months. The warranty period starts at the time of purchase. If the original receipt is lost, the warranty will be based on the product date code. The warranty covers failure due to defects in material or workmanship. Subject to the issues listed below, AMPTRON® will repair or replace the battery charger and/or parts of the battery charger if the components in question are defective in materials or workmanship. In the unlikely event your battery charger fails, we will arrange to get it back to one of our labs to assess the battery charger and determine the cause of failure to see if it is repairable. If the battery charger is repairable, it will be repaired at no cost and returned to you. If it is not repairable and the issue was caused by a manufacturer defect, we will replace the battery charger at no cost. Warranties are non-transferrable and stay with the original purchaser of our products. Manufacturer is not obligated to warrant the AMPTRON® battery charger in question, if defects are related to damages caused by abuse/neglect, or from the following: - Damage from shipping, loose terminal bolts or corroded hardware - Manufacturer codes tampering or removal - Failure to properly install the battery charger - Breakage from collision, fire or freezing—which includes damage from extreme heat or cold, improper storage, water damage. All bolts must be firmly tightened with a torque wrench and NOT by hand to avoid overheating caused by a loose connection. The warranty does not cover consequential damage or injury, discharged batteries, rental, freight, labour or administrative costs. Warranty replacement or repair will only occur after the battery charger is returned to base, tested and failure deemed to be a genuine claim. AMPTRON® authorised dealers and distributors may offer an additional warranty to the Manufacturer’s Limited Warranty. Manufacturer is not responsible for dealer or distributor created warranties or any claims that may arise from said warranties. Customers should adhere to all AMPTRON® documentation and guidelines. Manufacturer will not be responsible for any expenses related to installation/removal, electrical system tests, battery charging, loss of time or other expenses which should be considered incidental damages, including all shipping charges after the first 30 days of warranty. There are no returns or exchanges accepted. Our zero return policy is effective at the time of purchase. As always, our commitment to excellent customer service is our top priority. Please contact us if you have further questions about our warranty and return policy. PLEASE NOTE - Customers are responsible for all shipping fee's following the first 30 days of purchases.